For the last couple of years, there have been rumblings that the Beatles' catalogue would be released in mono on vinyl, and sure enough, this latest wave of reissues has been announced. The albums will be out on September 9 in North America and a day earlier overseas. This campaign will include the group's nine UK albums, the U.S. issued Magical Mystery Tour, and the non-LP compilation Mono Masters (which is split across three records). 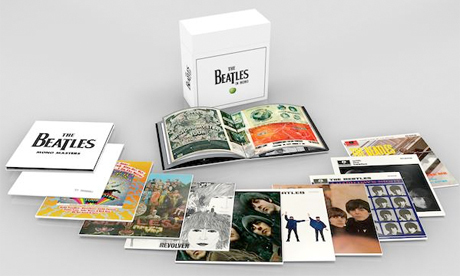 These have been newly mastered from the original analogue tapes and will be available individually or in a 14-LP box set called The Beatles in Mono. The set comes with a 108-page hardbound book, and all LPs are pressed on 180-gram vinyl. The albums were remastered at Abbey Road Studios by Sean Magee and Steve Berkowitz, using no digital technology and with the intention of pleasing audiophiles. So why do some listeners prefer mono to stereo? A press release explains, "Up until 1968, each Beatles album was given a unique mono and stereo mix, but the group always regarded the mono as primary." The albums involved in this campaign are listed below. Scroll past that to watch a trailer about the mono LPs.